Ainsworth Stormin 7's Slots: Take a FREE Pokies Spin Right Here. Seven does not have to be your lucky number for you to win great prizes in Ainsworth Stormin 7’s free online video pokie. However, if it is your lucky number then you will find the slot more exciting to play. 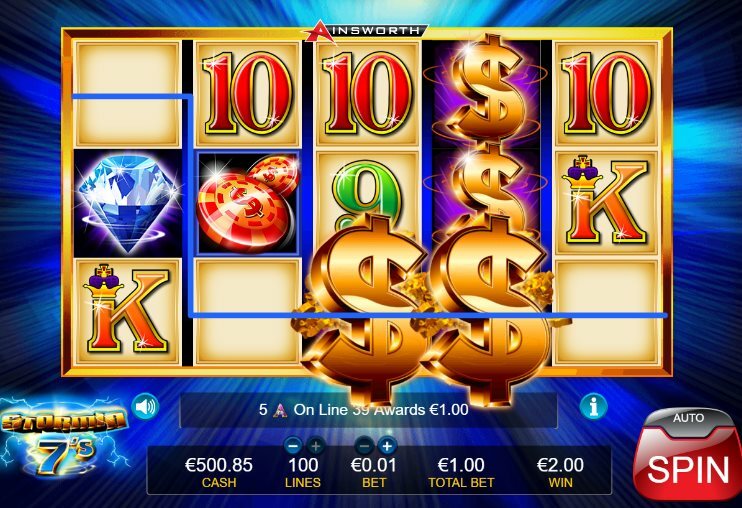 This is one of the popular online slots by Ainsworth and features the solid game play characteristic of the developer. Unlike other slots, this game is based contemporary casino setting rather than mystics or farm animals. Here is a brief descriptive review of the online slot including a look at its theme, game play and how you can win. As a game based on modern casino setting, Stormin 7’s online video slot features several symbols from popular casino games. A perspective blue backdrop highlighted by lightning strikes and golden hues presents the ideal background for symbols such as poker chips, cards, dice, diamond and stacked cash. The theme is reminiscent of a space movie hallmarked by a bright light piercing through the night sky. You will also encounter casino cards such as King, Queen, Joker, Ace, 10 and 9. Cracking thunder alongside a mix of soothing and temperamental sounds complement the theme of what is otherwise a top-tier experience in the world of online pokie machines that NZ players love. Stormin 7’s is a five-reel slot machine that offers 100 pay lines where you can stake any wager from 0.01 to 100 coins. This gives you a maximum bet value of 10,000 coins and a minimum of 0.01. To activate your reel, simply press the red play button at the bottom left section of the interface. You can also choose the option auto-play and let the machine do the work for you. This game has two wild symbols and one scatter. The first wild is a stacked dollar symbol that can be used to substitute other symbols for a winning combination. It cannot substitute the scatter (diamond) or second wild (Stormin 7’s symbol). The second wild only becomes so in the 2nd, 3rd and 4th reel. Landing 3 or more diamond (scatter) symbols triggers your 10 free spins while landing the second wild in 2 or more reels activates a “respin” feature. This feature automatically spins all the other reels and can be re-triggered. Other features in the game include multipliers when you land the second wild symbol on reel 2 or 4 and a gambling feature that can double your win. Winning in Stormin 7’s is not that different overall from other games. You need to land three symbols of the same kind for a winning combo and the each symbol has an assigned value according to the table rules. Scatter diamonds are the highest paying symbol (1,000,000 coins for 5) while poker cards pay the least (10,000 for 5 symbols). With the multipliers and free spins, you can win big prizes in this game. Even better, you can let the machine do the work through auto-play feature. Stormin 7’s is an exciting game for any online video slot punter and presents an opportunity to make awesome profits if luck is on your side. However, the experience will only be as good as the casino you choose to play at. It is recommendable to carefully review the bonus offers terms and conditions before signing up with any online casino. Make sure they are credible, reputable and reliable from our NZ player approved casinos. They should offer a secured flawless gambling platform with user friendly interface.